The moon will not turn green on April 20, 2016. 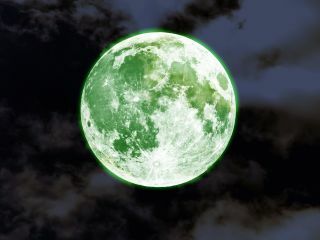 A online rumor predicting a green full moon is nothing more than a lunar hoax. "I know this probably isn't true, but can you verify this?" As if there were some reasonable chance that, on a given night, Mars would appear as large as the moon in the sky, or that there would be a huge planetary object that would ultimately spell disaster for our planet, or that on a given day, you could become weightless. Or that the moon will turn green. Use your critical-thinking skills: If something sounds too weird, crazy or amazing to be true, it probably isn't true. So, if somebody sends you an email or a tweet, or you see a Facebook post announcing that the moon will turn green on April 20 or May 29, just ignore it. Please?